Beyond answering quirky questions, voice assistants are expected to grow in capabilities and more importantly, to grow in broader market acceptance. Voice interaction with tech devices is back in vogue again, and technology users are different than they were 20 years ago. At CES 2017, voice assistants got a lot of attention, especially with the many IoT devices announced that used Amazon’s voice assistant Alexa. How many voice assistant early adopters are there? Wireless Bluetooth Headset wearers spend 2.7 times as much as the average Connected Adult on digital content. Use of headsets and voice agents has been in tech media news recently as tech companies are trying again to light a spark among consumers. The use of Bluetooth headsets has not grown for years. However, as the results of this MetaFAQ reveal, the few active users are big tech spenders and coveted. Wireless Bluetooth headsets have gotten extra attention recently, with the recent release of Apple’s iPhone 7, Amazon Dot and Echo updates, and Google’s announcements around expanding the capabilities and reach of their voice agent Google Assistant. 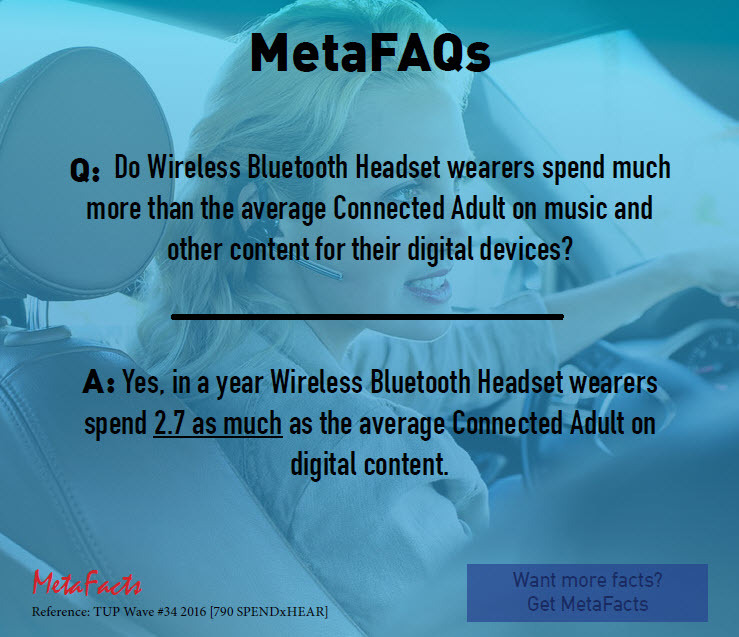 This MetaFAQs research result addresses one of the many questions profiling active wireless Bluetooth headset users.